With just over three months to go until Star Wars: The Force Awakens hits theaters (at the time of writing this), Disney and Lucasfilm are getting ready to commence the next wave of marketing for their highly-anticipated tentpole. The arrival of "Force Friday" on September 4 essentially marks the official beginning of this, as all of the tie-in merchandise (ranging from books to Hasbro action figures) will hit shelves. The event was such a monumental occasion that Lucasfilm hosted a global unboxing event today, debuting all kinds of toys and collectables ahead of the big day. And not only will these items make a fine addition to any Star Wars fan's collection, they may even have some clues pertaining to the film's elusive plot. First up is the new astromech droid BB-8, who is poised to become one of the saga's most marketable new characters. The adorable little soccer ball robot has already made a tremendous impression with moviegoers, as he was created and operates practically. Now those who want to have their own BB-8 can have that chance, thanks to the toy company Sphero. This BB-8 toy is quite the technological achievement, as consumers will be able to sync it up with their mobile device to give it commands, move around, and even record holographic messages. The Star Wars movies were always ones to push the boundaries in technology, so it's fitting to see their toy line follow suit. It's easy to see how this item will very much be in demand during the holiday season, providing people with hours of fun. BB-8 is the droid we're looking for indeed. In addition to figures that fans can play with, Force Friday will also be bringing ones fans can display. Hot Toys has become famous for their strikingly realistic collectible statues of several pop culture icons, and they surely were not going to miss out on the Force Awakens festivities. The latest additions to their impressive Star Wars lineup are 1/6 scale figures of new villain Kylo Ren (Adam Driver) and First Order stormtroopers. Collider has a photo gallery, which shows once again Hot Toys are masters of intricate detail. Should the new villains add to the legacy of what's come before, many fans will be interested in picking these up. However, the juiciest bits of pre-Force Friday coverage comes from IGN, who managed to get their hands on a couple of talking action figures: Finn (John Boyega) and Kylo Ren. Even though we've gotten two trailers so far, the amount of dialogue we've heard up to this point is minimal, so moviegoers will surely be dissecting the lines from the toys for plot hints. The Finn toy doesn't have anything too revealing. Many of his lines, like "Stay low and put up the shields" and "We need cover - quick!" 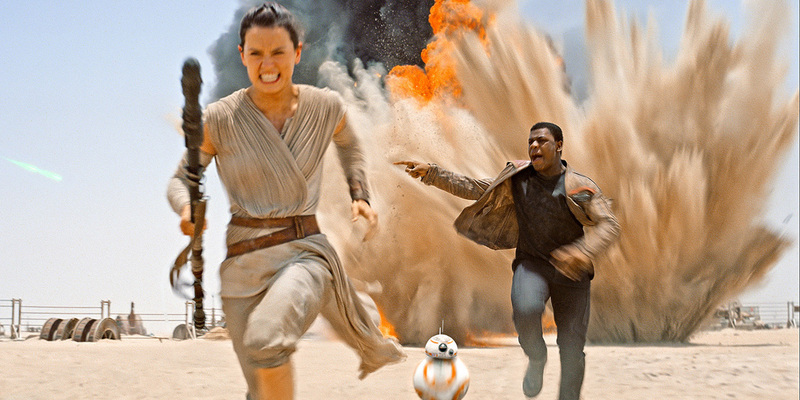 sound like they're from an action sequence, perhaps the Millennium Falcon chase on Jakku. His "I never should have rescued you!" could be directed at Daisy Ridley's Rey, but taken out of context, it's difficult to say for sure. Of note is that the British thespian seems to be using an American accent to play Finn, but that isn't anything out of the ordinary (see: Christian Bale as Bruce Wayne). Where we seem to dive more into the story is with Kylo Ren, who comes equipped with a number of intriguing lines. It's long been speculated that the MacGuffin of The Force Awakens is Luke Skywalker's original lightsaber he lost at Cloud City, which holds the key to opening an ancient Sith tomb. One can only assume that Kylo is referring to that lightsaber when he says things like "You know what I've come for" and "That weapon is mine." He also seems to be addressing Rey in the line "Is it true... you're just a scavenger?" which is delivered in almost a taunting fashion. That will only inspire countless more debates about whether or not the two are related in some capacity, as has been theorized. The other fascinating line the Kylo figure speaks is "Together, we will destroy the Resistance and the last Jedi." Since "Jedi" can be singular or plural, is he just speaking of Luke, or are there others who have been trained in the 30 years since Return of the Jedi? The film's subtitle seems to infer Force users have been dormant for a long time, so perhaps the elder Skywalker really is the only one out there. Time will tell. In the meantime, Star Wars fans will be excitedly shopping over the weekend, picking up any merchandise they can get their hands on, adding to their collections ahead of the new film. And who knows? Maybe that third trailer will be part of the festivities.